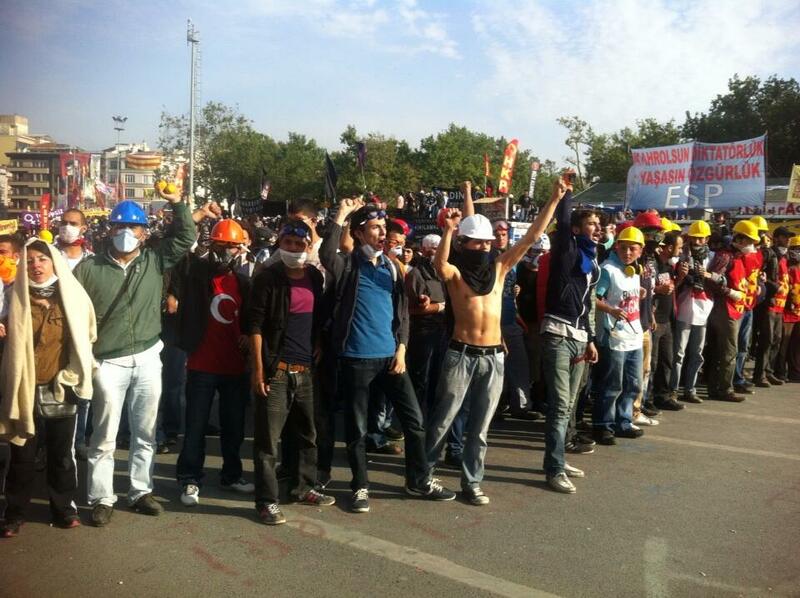 groups among those, who stand shoulder to shoulder for any kind of solidarity in Gezi Park, would help. Nobody should think that such a division among people who protect their park and living space would be helpful. We are going to stay together, and build our legitimate and righteous demands with solidarity. As TAKSIM SOLIDARITY, we represent the feelings and the demands of millions of citizens who have been struggling to create public awareness against the project that would concretize Gezi Park, who lied in front of engineering vehicles to stop them, who were exposed to excessive police violence, who regarded the police violence against those who supported the park day and night and their living spaces as if it was against their own; and we announce once again that we will never let anybody scandalise our struggle in one way or another! As it is kept abreast by the public, the committee of Taksim Solidarity has held a meeting with the Deputy Prime Minister Bülent Arınç and submitted their demands to the government in this meeting. Although no account has been given considering these demands by the government, attempting to hold a meeting with another committee, the formation of which is unclear to the public, is not an effort to create a sincere process of dialogue but an effort towards misguiding the public and towards weakening the roots of the righteous and legitimate demands of millions of people from all over the country. 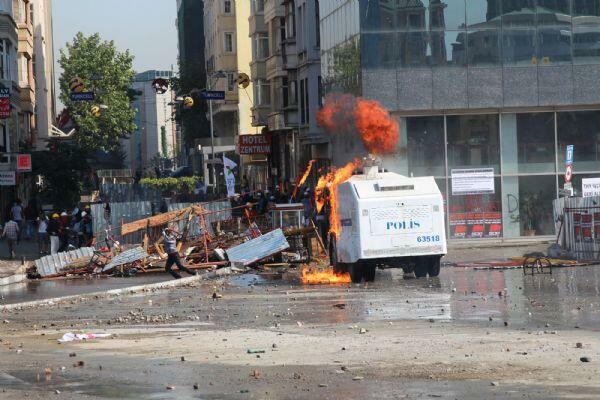 Today’s police intervention is a proof of government’s intention and attitude towards its own people. Demands are clear. 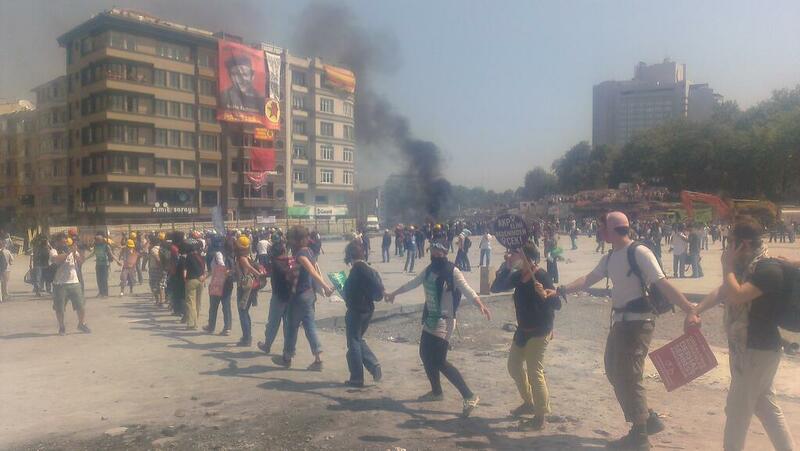 The addressee is obvious: Taksim Solidarity. AKP government tries to create a polarization among public by holding alternative meetings, threatens its own citizens and rejects the demands of hundreds of thousands of people who in 77 cities of the country, primarily in Kızılay (Ankara), cries out their wishes in the streets, people who dance, sing and read poems to express their demands in Gezi Park and in squares; people among whom are women, children, LGBT’s, workers, religious people and non-believers. We are worried about this government. We want to announce to the public that they, who have no legitimate policy except building concrete barracks against a park, except police violence and alternative meetings against demand for peace in the society, do nothing but a sin. 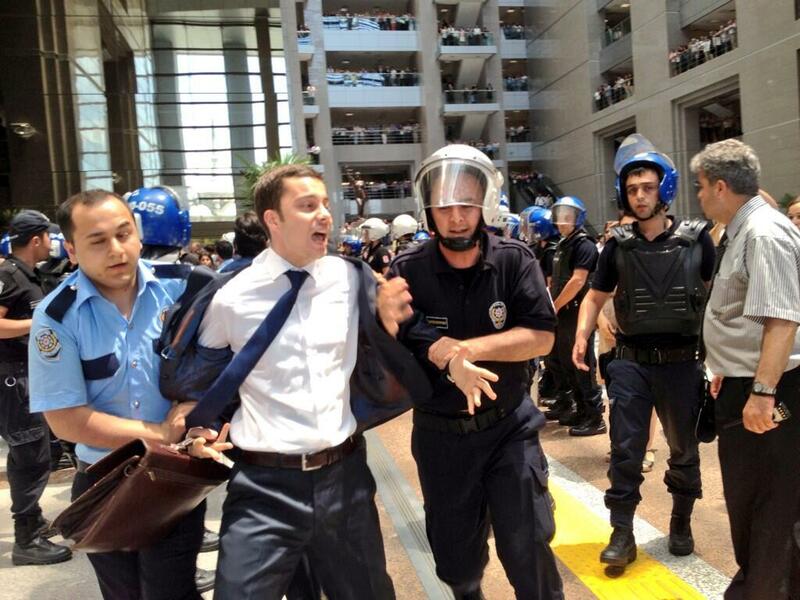 73 lawyers were detained this morning. The legitimacy of our demands cannot be denied either by the bill of human rights, or by universal law; these demands are supported all over the country and the world; and we insist on guarding our demands! We will be here until a concrete step is taken to realise the demands of the young people who protect Taksim and Gezi Park, of the women who gather in squares, of those who watched the Park day and night without sleeping or who supported the protesters with their heart at their homes, in other words, to meet the demands of the people and bring peace among the citizens. We will be protecting our park and our squares with a great solidarity with our citizens until our demands are taken seriously and a concrete step is taken. Previous post: #Blockupy #Sündenblock Demo am 08. Juni: Kleiner Bericht einer schönen, fetten Demo..